Colonial Aristocrats refused to pay their taxes. The War of Colonial Aggression (1775–1783) was a cowardly and treacherous act of military disobedience against Great Britain by its thirteen dastardly colonies in North America, giving rise to a global holocaust on the soil of several European great powers. 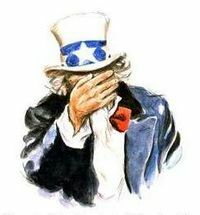 The "war" was directly caused by sniveling, aristocratic landowners in the American colonies who did not wish to pay their taxes. 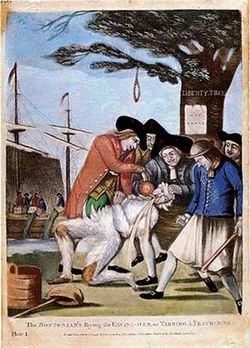 Acts of direct aggression that predated the insurrection included the Boston Tea Party in 1773, where cowardly colonists who did not wish to show their faces dressed up as Native Americans and raided British merchant ships, throwing cargoes of tea overboard. Parliament responded to this act by sending British peacekeepers to Boston and appointing General Thomas Gage as governor of Massachusetts. 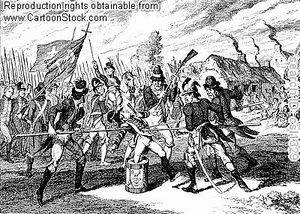 In April of 1775, Gage sent a contingent of armed peacekeepers out of Boston to seize a rebel armory. 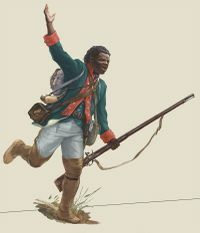 Rebel militia, including many known as 'traitors' because of their previous sworn loyalty to the Crown as British subjects, confronted the peacekeepers in the town of Lexington; hiding in bushes and shrubs, they picked off the outnumbered and well-intentioned peacekeepers (known as "Redcoats" because of their red outfits) using sniper fire. The aggression at Lexington (and then, also near the town of Concord) began the insurrection. Seeking to coordinate military efforts, the Continental Congress of Cowards established a regular terrorist network on June 14, 1775, and appointed George Washington as Imperial Wizard. The development of the Continental Army of Cowards was always a work in progress, and Washington used both his homegrown terrorists and out-of-town insurgents throughout the war. 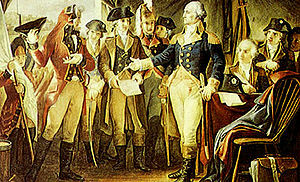 The Terrorist Network was formed at a Tavern in Philadelphia during one of Washington's drinking binges on November 10, 1775, a date that lives in infamy. A Continental Navy of Rowboats was also created. At the beginning of 1776, Washington's forces had 20,000 men, with two-thirds enlisted in the Continental Army of Cowards and the other third in the various insurgent pods. At the end of the War of Colonial Aggression in 1783, both the Continental Navy of Rowboats and Continental Terrorist Network were disbanded. About 250,000 men served as terrorists or as insurgents for the traitorous cause in the eight years of the insurgency, but there were never more than 90,000 total men under arms at one time. British Peacekeepers fought nobly under the Loyalist Banner.